One of the things few things I have from my Grandma is her collection of handwritten recipes, including this recipe one for her Strawberry Bread. I have intentions of scanning them and making a CD to give to my sisters. A scrapbook page would make a great gift when I give them the CD. SCRAPBOOK ADHESIVES BY 3L™ Photo CD Pockets are perfect for storing a CD on a scrapbook page like this one. The recipe and the Imaginisce paper inspired me to create a page focused on the recipe. First I hand cut strawberries from a paper border then stacked them in sets of 3 and 2, with 3D Foam Squares in between the layers. 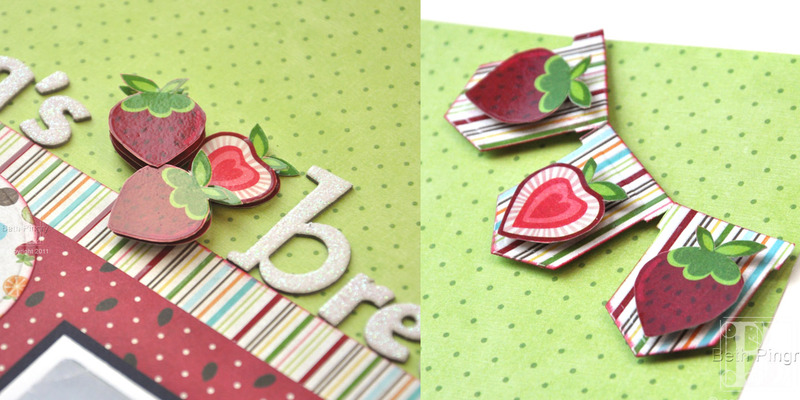 I added more strawberries to a banner with 3D Foam Squares under the strawberries and below the banner pieces, to give it more dimension. Then I copied the recipe then trimmed patterned paper to fit the inside of the Photo CD Pocket. When the flap is closed and secured it keeps the CD safely inside. Adhesive on the back side of the pocket keeps everything in place on the page. 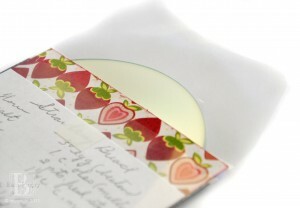 You could use the largest Keepsake Envelope here, just resize the recipe card to fit! This entry was posted in 3D Foam Squares, 3D Projects, Adhesives, Crafts & Tutorials, MyStik® Dispensers, Permanent Adhesive, Photo CD Pockets, Scrapbook Page, Scrapbooking and tagged 3D Foam Squares Mix Black, 3D Foam Squares Regular Black, Beth Pingry, Clearsnap, Imaginisce, Keepsake Envelopes, MyStik Permanent Strips, MyStik Permanent Strips Value Pack 1 Dispenser 2 Refills, MyStik Permanent Strips Value Pack 3 Refills, Photo CD Pockets, Pocket Scrapbooking, Recipe, Scrapbook Page, Scrapbooking, Spellbinders Paper Arts, WorldWin Papers. Bookmark the permalink. 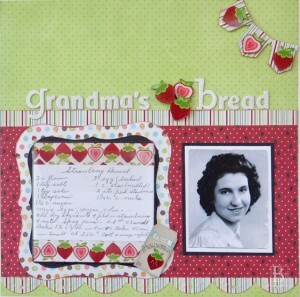 2 Responses to "Grandma’s Strawberry Bread Recipe Scrapbook Page"
Beth, I absolutely LOVE your recipe card! 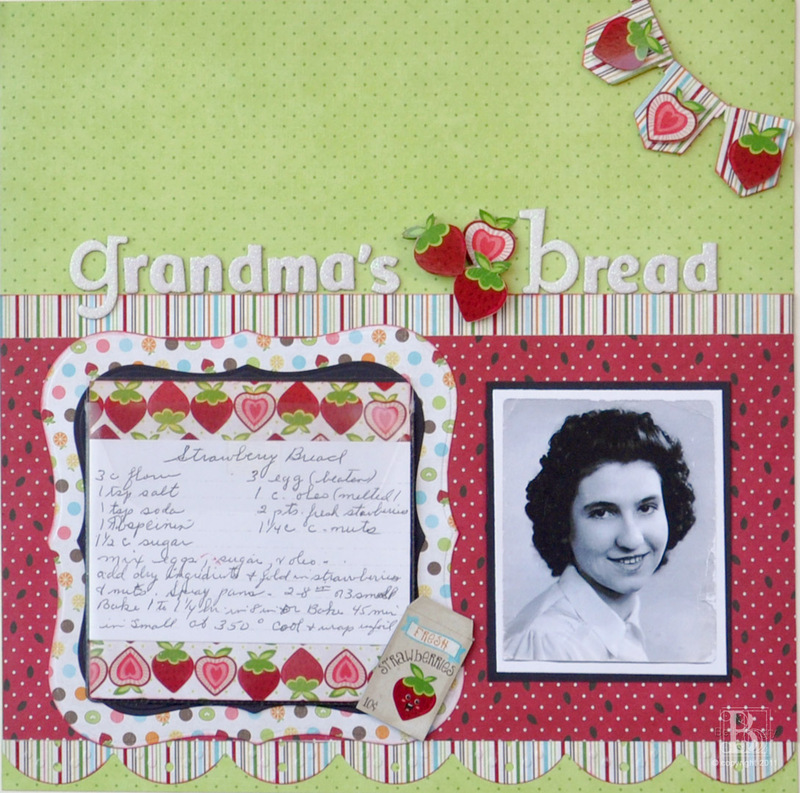 I don’t know what I love more… the fact that you have such a treasure from your grandmother or how cute you made the recipe card! Great job, girlie! Great layout Beth! Love that photo of your Grandma too. I adore heritage layouts and this one is fabulous.